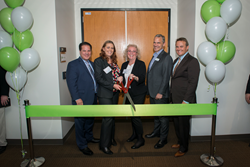 In recognition of the recent expansion of its headquarters, First Associates Loan Servicing, LLC the nation’s fastest growing loan servicing company, hosted a standing room only “Ribbon Cutting Ceremony” on Wednesday, March 2nd, at its newly renovated facility in San Diego. The ceremony celebrated the recent expansion of their headquarters to accommodate the company’s continuing growth. The ceremony coincides with First Associates 30th Anniversary of business leadership in the San Diego community. “The new expansion will enable us to continue to serve our clients and their rapidly expanding businesses. We appreciate the support we receive from the local San Diego community and are honored by the proclamation from the Mayor, officially naming March 2nd as First Associates Day,” said David Johnson, CEO, First Associates Loan Servicing. The invitation only ribbon cutting ceremony and 30th Anniversary celebration was attended by representatives of Wall Street’s leading investment firms, leaders from the FinTech industry, and the entire First Associates team. First Associates Loan Servicing is the fastest-growing third-party loan and lease servicer in the United States. With thirty years of experience in the consumer finance industry, First Associates is the country’s leading marketplace lending loan servicer. The company, based in San Diego, works with a wide range of asset classes, including marketplace lending, automotive, purchase finance, powersports, and small business. The company also offers a variety of support solutions, including backup servicing and custodial functions. For more information, visit http://1stassociates.com/.